Question 1 What is meant by luminous object? Give example? Question 2 What is meant by non-luminous objects?Give example? Question 3 Define the term reflection of light? Question 4 What is meant by incident ray? Question 5 What is meant by reflected ray? Question 6 What do you mean by point of incidence? Question 7 Define the angle of incidence? Question 8 Define the angle of reflection? Question 9 What type of reflection takes place from a smooth surface and a rough surface? Question 10 What makes things visible to us? Question 11 How we are able to see the moon? Question 12 State two laws of reflection? Question 13 What is the difference between a regular reflection and an irregular reflection? Question 14 Why a book lying on a table in a room can be seen from all parts of the room? We need a source of light to make the objects visible. As soon as light from a torch, an electric bulb , a tube-light falls on the object, we are able to see it clearly even in a dark room or in the darkness of night. It is light which makes things visible to us. Light enables us to see things from which it comes or from which it is reflected. The objects which emit their own light are called luminous objects. The luminous objects are the sources of light. They produce their own light and then emit this light. The sun, stars, electric bulb, glowing tube-light, torch, fire, and flame of a burning candle, are all luminous objects. We can see the sun because the light given out by sun enters our eyes. The objects which do not emit their own light are called non-luminous objects. They cannot produce light, therefore, they cannot emit their own light. For example: The moon, earth, planets, table, chair, book, trees, plants, flowers, human beings, fan, bed, mirror, diamond, walls, floor, roads etc. The non-luminous objects can be seen only when light coming from a luminous object falls on them. This light is reflected by the non-luminous object in all directions. And when this reflected light enters our eyes, we can see the non-luminous object. The moon is a non-luminous object which does not have its own light. We can see the moon because moon reflects light (received from the sun) into our eyes. Thus, moon is a reflector of sunlight. We can see a book because the sunlight (bulb-light or tube-light) falling on it is reflected by the book into our eyes. The non-luminous objects are also called illuminated objects (because they get illuminated or lighted up by the light of luminous objects falling on them). The process of sending back light rays which fall on the surface of an object, is called reflection of light. A plane mirror reflects almost all the light which falls on it. In order to study the reflection of light, we need an apparatus which can produce a thin beam of light. We use an apparatus called ray-box to produce a thin beam of light. A ray-box has a light bulb inside it and there is a narrow slit in front of the box.When the light bulb is switched on, a very thin beam of light (or a narrow beam of light) comes out of the narrow slit of the ray-box. This narrow beam of light is then used to study the reflection of light from a plane mirror. The thin beam of light produced by a ray-box is visible on a white sheet of paper, so its path on paper can be traced by using a pencil.The ray-box is also ray streak apparatus. (1) The ray of light which falls on the mirror surface is called incident ray.The incident ray tells us the direction in which the light from a source falls on the mirror. The incident ray always goes towards the mirror. (2) The point at which the incident ray strikes the mirror is called the point of incidence. The point of incidence tells us where exactly light falls on the mirror surface. (3) When the incident ray falls on a mirror, the mirror sends it back in another direction.The ray of light which is sent back by the mirror is called the reflected ray. The reflected ray tells us the direction in which the light goes after reflection from the mirror.The reflected ray always goes away from the mirror.There can be only one reflected ray for a given single incident ray falling on a plane mirror. This is because the same ray of light is called incident ray before it strikes the mirror and becomes reflected ray after it rebounds from the mirror. (4) The normal is a line drawn at right angles to the mirror surface at the point of incidence. The normal is a line which is perpendicular to the mirror surface at the point of incidence.We usually represent normal to the mirror by a dotted line to distinguish it from the incident ray and the reflected ray. The normal is an imaginary line which is drawn on paper for the sake of convenience in understanding the laws of reflection. Normal lies exactly in-between the incident ray and the reflected ray. (5) The angle between incident ray and normal is called the angle of incidence. The angle of incidence is represented by the letter i. The angle of incidence is made by the incident ray with the normal to the mirror surface and not with the mirror surface itself. (6) The angle between reflected ray and normal is called the angle of reflection.The angle of reflection is represented by the letter r.
When a ray of light falls on a plane mirror, it gets reflected. The reflection of light from a plane mirror takes place according to two laws which are known as laws of reflection of light. First law: The incident ray, the reflected ray, and the normal (at the point of incidence), all lie in the same plane. They are neither coming up out of the paper nor going down into the paper. If we change the angle of incidence, the angle of reflection will also change . The new angle of reflection will also be equal to the new angle of incidence. When a ray of light is incident normally (or perpendicularly) on a plane mirror, it means that it is travelling along the ‘normal’ to the mirror surface.Since the angle of incidence is zero, so according to the second law of reflection, the angle of reflection should also be zero. The reflected ray will also travel back from the mirror along the normal. Thus, a ray of light which is incident normally (or perpendicularly) on a mirror is reflected back along the same path. In regular reflection, a parallel beam of incident light is reflected as a parallel beam in onedirection. Regular reflection of light occurs from smooth surfaces like that of a plane mirror or highly polished metal surfaces. For example: When a parallel beam of light falls on the smooth surface of a plane mirror, it is reflected as a parallel beam in only one direction.Images are formed by regular reflection of light. of light and form images. A polished wooden table and a marble floor with water spread over it are very smooth and hence produce regular reflection of light. Reason: All the particles of a smooth surface (like a plane mirror) are facing in one direction. Due to this the angle of incidence for all the parallel rays of light falling on a smooth surface is the same and hence the angle of reflection for all the rays of light is also the same. Since the angle of incidence and the angle of reflection are the same (or equal), a beam of parallel rays of light falling on a smooth surface is reflected as a beam of parallel light rays in one direction only. In diffuse reflection or irregular reflection,a parallel beam of incident light is reflected in different directions. The parallel incident rays do not remain parallel after reflection, they are scattered in different directions. The diffuse reflection of light takes place from rough surfaces like that of paper, cardboard, chalk, table, chair, walls and unpolished metal objects. For example: When a parallel beam of light rays falls on the rough surface of a sheet of paper, the light is scattered by making reflected rays in different directions. Thus, a sheet of paper produces diffuse reflection of light. No image is formed in diffuse reflection of light. The light rays falling on the rough surface of paper are scattered in all directions and hence no image is formed. Reason: The particles of a rough surface are all facing in different directions. Due to this, the angles of incidence for all the parallel rays of light falling on a rough surface are different and hence the angles of reflection for all the rays of light are also different. Since the angles of incidence and the angles of reflection are different, the parallel rays of light falling on a rough surface go in different directions.The diffuse reflection of light is not due to the failure of the laws of reflection. 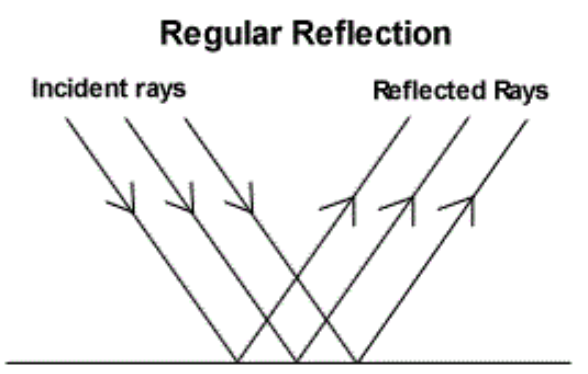 Diffuse reflection is caused by the roughness (or irregularities) in the reflecting surface of an object. Most of the objects around us cause diffuse reflection of light and scatter the light falling on them in all directions. In fact, we can see these objects only because they scatter light rays falling on them in all directions. 1) A book lying on a table can be seen from all parts of the room due to diffuse reflection of light from its surface. The surface of book, being rough, scatters the incident light in all parts of a room. Hence the book can be seen from all parts of the room. 2) A cinema screen has a rough surface and causes diffuse reflection of light falling on it. The cinema screen receives light from a film projector and scatters it in all directions in the cinema hall so that people sitting anywhere in the hall can see the picture focused on the screen.